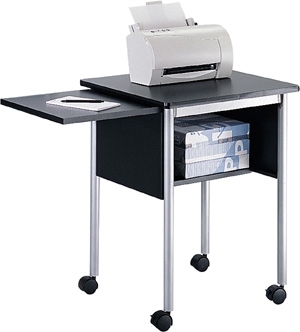 Compact unit is ideal for projectors, printers, copies or fax machines. Convenient 14"W slide-out surface mounts on left or right to provide an extended work area. Open lower compartment features modesty panels on three sides and features a convenient storage shelf. Sturdy steel construction. It rolls easily on four swivel casters (two locking). Black with Black 3/4" laminate top and contrasting Metallic Gray steel legs. Assembly required. Includes Manufacturers Limited Lifetime Warranty.